Whether it is the year long anticipation leading up to pecan pie at Thanksgiving, or the near-constant presence of those oblong green spheroids that seem always underfoot in a sweltering south Georgia summer, there is something about pecans that is as Southern as sweet tea, hospitality and y’all. So when Lazy Magnolia brewery in Kiln, Miss. came up with the idea for a nut brown ale made with pecans, it seemed so ingenious in its simplicity, I wondered why I had never heard of such a beer before. The brewery and Southern Pecan Nut Brown Ale are the brainchildren of Leslie and Mark Henderson, both Mississippi natives and engineers. But creating a brew with the crunchy yet delicate nut was not without challenges. 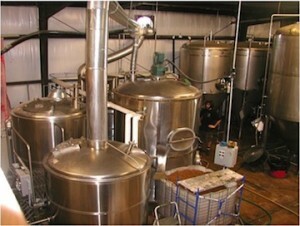 Nuts are difficult to incorporate into beer because of their high oil content. While Southern Pecan is their flagship beverage, Lazy Magnolia also offers five other beers, with plans to introduce a winter seasonal soon. Descriptions of the beers read like a tour of the state. Southern Gold, a golden honey ale, was made for Hattiesburg and the University of Southern Mississippi, with local honey from Ellisville. Ship Island Ale is somewhat tropical and celebrates its namesake just off the Gulf coast. And then there’s Reb Ale, named after Ole Miss’s infamous Colonel Reb and meant to honor Oxford and their support for the brewery. Unfortunately, “because that beer is kind of tied to that, we’ve had some markets that don’t want to pick it up, because some people won’t drink it strictly on that,” Corr said. “Especially in the SEC, there’s so much loyalty to your own university.” Reb Ale will soon be renamed Deep South Pale Ale, and fervent fans all over the SEC will be able to enjoy it without being disloyal to their Volunteers, Bulldogs or Gators. Lazy Magnolia’s website proudly declares it to be “Mississippi’s brewery,” and it is the only craft beer establishment in the state. Part of the reason for this may be the Magnolia state’s traditionally bone-dry laws. content. We are one of the last states, if not the last state, to have such a low cap on that. However, groups like Raise Your Pints, Mississippi are working to change or soften many of the laws restricting brewers and distributors. Corr said she believes that if the laws change, the brewery could attract even more customers through events, dinners and a fully-equipped tasting room. Despite the strict blue laws, there is a lot to love about working in Mississippi. The water in Kiln is perfect for making beer, especially Southern Pecan. And of course, there’s the Southern culture. “It just makes me proud that we are so nice to each other,” Corr said. “Anything you need, people will come up and help.